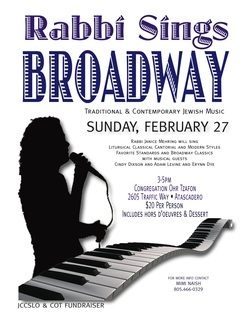 Join Rabbi Janice Mehring on Sunday, February 27 at 3pm for RABBI SINGS BROADWAY, an afternoon of Traditional & Contemporary Jewish Music, and a concert benefit for both the Jewish Community Center of SLO and Congregation Ohr Tzafon. With musical accompaniment by local musicians, Cindy Dixon, Dave Becker, and Adam Levine, and guest vocalist Erynn Dye of the Central Coast Children's Choir, Rabbi Mehring will sing classical and contemporary cantorial music, as well as her favorite standards and Broadway classics. The program will include some classical piano, instrumental jazz, a bit of klezmer, and some fun song surprises. The concert includes something for everyone. Rabbi Mehring will narrate as she goes, providing background on the liturgy, composers, and Jewish music history. Rabbi Mehring has served as cantorial soloist at synagogues and events throughout the county. She is currently the rabbi at Congregation Ohr Tzafon ('Light of the North.") and sings with Canzona, a women's chamber vocal ensemble. Ticket price includes snacks & non-alcoholic beverages. Wine will be available for purchase. And you'll be able to bid on a few very special silent auction items. COST: $20/Ticket. Includes hors d'oeuvres and non-alcoholic beverages. In addition to serving Congregation Ohr Tzafon ('light of the north') as rabbi, Janice Mehring has been a singer and cantorial soloist for many years. She currently sings with Canzona, a women's ensemble in San Luis Obispo, has been a member of the Cuesta Master Chorale, and sung in recital with the voice studio of Mary Sue Gee. She studied hazzanut, cantorial performance and liturgy, with Cantors Perryne Anker and Nathan Lam of Stephen S. Wise Temple in Los Angeles. Adam Levine has been a session musician with artists on Capitol, Warner Brothers and Motown Records, and also has extensive commercial and TV credits. Currently, he is the lead guitarist/ composer for Human Nation, a band he formed in the spring of 2009. Their music draws on samba, funk and jazz with much of the music composed by Adam. They have performed locally and will begin touring this year. Adam Levine also has a 30+ year teaching career, which includes being the director of the Grove School of Music, and a nationally recognized teacher at the National Guitar Workshops. David Becker is a freelance saxophonist, arranger and instructor at Cuesta College and the Cal Poly Department of Music. A graduate of the University of Florida in music education, he has performed with Gordon Goodwin, Eric Marienthal, Bobby Shew, Sam Rivers, Manhattan Transfer, Smokey Robinson and The Temptations among others. Since 2007, he has served as orchestrator for the SLO Symphony's annual Pops Concert in Avila Beach. He also plays with several local pop and jazz groups, is Contemporary Music Director at Mt Carmel Lutheran Church and has toured with Princess Cruise Lines orchestras. Erynn Dye is a high school sophomore from Paso Robles whose interests span the artistic spectrum. Her love for singing is evidenced by a 10 year span of choral performances with Central Coast Children's Choir. She's thankful to have been chosen for several ACDA Regional and National Honor Choirs. Studying piano with Debbie Lagomarsino has brought Erynn much musical joy. As time allows, she participates in jazz and ballroom dancing, musical theatre productions and horseback riding. Erynn is happy to be joining in this concert experience. Want to read more about this group?